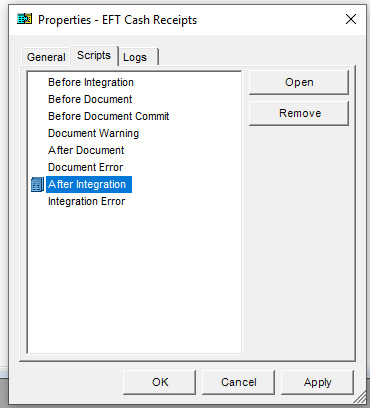 ​​I import a batch of EFT payments received using Integration Manager. 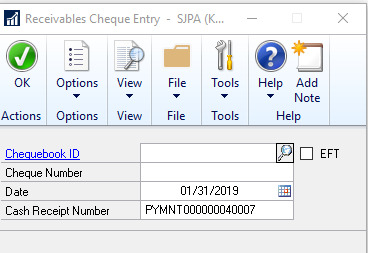 I do not see how to configure the mapping in IM so the EFT checkbox in the Receivables Cheque Entry window is checked. Does anyone know how to get around this so I do not have to manually mark the EFT checkbox for each transaction? I would suggest using Integration Manager scripts. 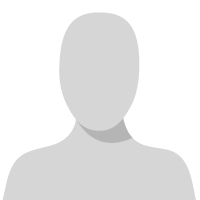 I would capture the batch ID in the Before Integration, and use it to run a script to update the records in SQL in an After Integration script. This will allow you to run the integration and update the flag, after it completes. @Krista Foster We had this same issue. I was told by my partner there is no standard mapping in Integration Manager to do this. Instead, they created a script for the integration that does it. See the screen shot for the script (not sure if this is universal for all installs of GP or specific to us). ​It's a script added at the integration level (if you right click the integration name and go to Properties, you'll see the below window. Then click the Scripts tab). You could either take a stab at this yourself (and test in a test environment) or have your partner assist. ​Thank you both for your feedback. I will give this a try!